Symptoms of kidney failure in older cats can be managed through diet and care. Kidney failure, also known as, "chronic renal failure," (CRF) is a common illness in older cats. Though the condition is progressive and most likely terminal, with the proper diet and veterinary care, a cat with CRF may still live a quality life for years after diagnosis. When an older or geriatric cat's kidneys gradually lose their ability to filter waste products from the blood, the condition is first known as "chronic renal insufficiency" (CRI). As the disease progresses, the kidneys cease to function, and renal failure, or CRF occurs. There may be several causes for a cat's kidney failure, including hyperthyroidism (overactive thyroid gland), long-term consumption of a highly acidic diet, frequent urinary tract infections or kidney stones. Since diagnosis is difficult and rare in the early stages of CRF, any one source may be elusive, so there is no definitive way to prevent kidney failure in older cats, and treatment is palliative. Obtain a low-phosphorus, low-salt, low-protein, high-potassium "kidney failure" diet from your veterinarian if your cat has been diagnoses with CRF. Do not purchase cat diet products labeled, "For Urinary Health," as these diets are designed specifically for cats with bladder dysfunction and will harm a cat with CRF. Though "Urinary Health" diets are sold commercially in pet and grocery stores, diets for CRF are available only through your veterinarian. Choose the canned variety over dry food, as this will help your cat fight dehydration, since food in cans contains approximately 70 percent water. Be sure to leave plenty of extra water bowls throughout your home to encourage your cat to drink as much as possible. If your cat snubs his nose at his new diet, you may have to try a few tricks to stimulate his appetite. Mix two or more of his new foods together to enhance the flavor, or remove cold foods from the can, and warm them up for a few seconds in the microwave before presenting them to your finicky kitty. Check that the food is cool enough to eat all the way through before serving.Try mixing small amounts of low-salt or organic beef, turkey, tuna or vegetable broth into the food for variety, or simply add a small amount of warm water to the canned foods before serving. Place a small amount of the food on his paw to kick-start the dining process when he licks his paw clean, or add something smelly--like anchovy paste--to your cat's food to perk his interest. Feed your cat smaller meals throughout the day, rather than one or two large meals. The important thing is to keep your cat eating the special diet, so do your best to accommodate his whims without overtaxing his kidneys. Ask your veterinarian for a powder, paste, liquid or tablet potassium supplement to replace the nutrient, which is lost as a result of kidney malfunction. Your cat may also need aluminum hydroxide or epakatin--both phosphate binders--to help battle depression or anorexia in your CRF-afflicted cat. The hormone supplement Calcitrol may help extend the life of your cat's kidneys, and the hormone supplement Erythropoeitin can help battle anemia in cats with a low red blood cell count. Can Cats Recover From Kidney Failure? How Long Can Cats Live with Kidney Disease? 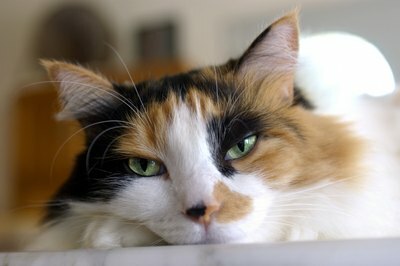 Do Older Cats Die Quickly When They Have Kidney Failure?